Various battery types exist, designed to fulfill specific functions based on the given battery's capacity and discharge rate. Batteries are rated based on these functions, with rating systems that differ based on the task the battery is expected to perform. Ampere-hours or amp-hours (AH) are used to express how long a battery can run while discharging a given amount of power and are used to rate batteries meant to deliver low currents for an extended period of time. If you wish to determine the AH rating of a battery not originally rated in amp-hours, you can do so at home with a multi-meter and a few hours of monitoring time. Batteries are rated in measurements depending on the tasks they are expected to perform. For example, batteries rated in ampere-hours (AH, also called amp hours) are designed to deliver low currents for an extended period. 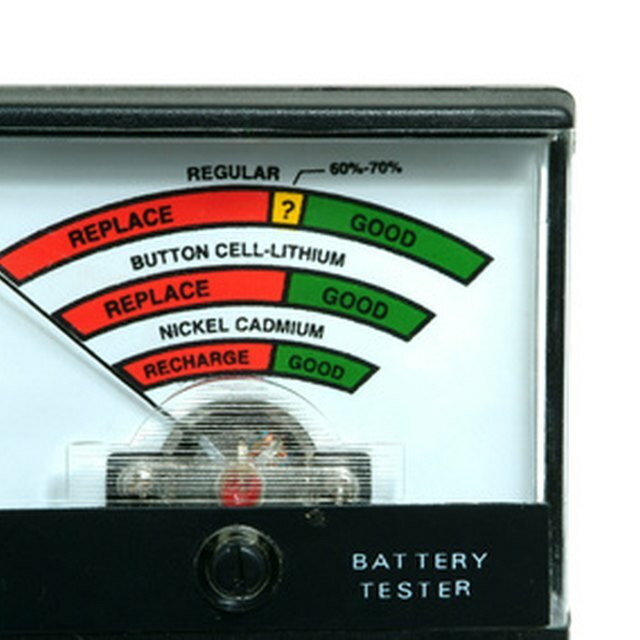 To determine the AH rating of a 12-volt battery, use a multi-meter. Connect a basic resistor across the battery's terminals, then monitor the discharge over time until the voltage decreases to 12 volts. You can then use a measurement of the battery's current to calculate the AH rating. To determine the AH rating of a 12-volt battery not already rated in amp-hours, begin by making sure the battery is fully charged. If the battery is not new, it should be charged with a battery charger and then left to sit for several hours to eliminate surface charge. With your multi-meter, measure the voltage across the battery's two terminals. A fully-charged 12-volt lead-acid battery should have a voltage of at least 12.6 volts across the terminals. If this is the case, the battery is ready to test. Connect a resistor of about 1 ohm and 200 watts across the battery terminals. When tested, your multi-meter should display a current of around 12 amps, but if this is not the case take note of the displayed current. To calculate the AH rating of your battery, you will have to determine how long it takes for the battery to discharge to roughly 50 percent capacity. To do so, monitor the voltage once per hour for the next few hours, taking notes throughout the process. The voltage should be decreasing by about 0.1 volts every two hours. If the decrease is faster, the resistance provided by your resistor is too small, and your current too high, to provide a proper estimate. You will need to connect a larger resistor to repeat the test procedure. The battery's voltage should decrease to about 12 volts after about 10 hours. Take note of the exact number of hours, and you'll be able to calculate the battery's AH rating. Once your battery has decreased to roughly half capacity, you can calculate the amp-hours rating of the battery through the use of a simple equation. Multiply the battery's current (as measured through the resistor) by the time taken for the voltage to decrease to 12 volts to determine the rating for a half-charge. Multiply this number by two to find your battery's true AH rating. For example, if your battery's current was 12 amps and the voltage reached 12 volts after 10 hours exactly, then the battery capacity is 12 x 10 x 2 = or a rating of 240 AH in total. All About Lead Acid Batteries: What are Amp Hours? Flournoy, Blake. "How to Determine the AH of a 12-Volt Battery." Sciencing, https://sciencing.com/determine-ah-12volt-battery-7733095.html. 04 June 2018.